Three men are observed drinking and talking. An unspecified time later a convoy of cars is travelling around the countryside at night with two of the men in custody as they try to remember where the body the man they have killed is buried. What starts out as a slowly unfolding police procedural shifts almost imperceptible to a Chekhovian character study of two melancholic profesionals on this odyssey, the prosecutor and the doctor, played by Taner Birsel and Muhammet Uzuner, and of the more impetuous local police chief, played by Yilmaz Erdoǧan. Once Upon a Time in Anaqtolia, the sixth film from celebrated Turkish director Nuri Bilge Ceylan (Uzak, Climates, Three Monkeys), requires some patience and concentration on the part of the audience was widely acclaimed on its release, being described by Peter Bradshaw in The Guardian as "a brilliant, masterly film" and "Ceylan's best yet" and by Nick James in Sight and Sound as an "extraordinary tour de force". It also won Ceylan his second Grand Prix win at Cannes. 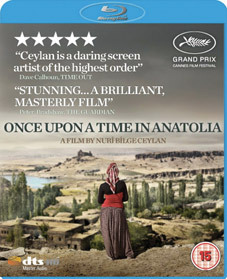 Once Upon a Time in Anatolia will be released on UK Blu-ray and 2-disc DVD on 9th July 2012 by New Wave Films at the RRP of £15.99 for the DVD and £19.99 for the Blu-ray.